A key feature that's new in Emoji 5.0 is support for subdivision flags. This means that for the first time, vendors are now free to support US states flags (hello Texas and California), along with any other valid subregion around the world such as Scotland, or Grand Cape Mount. Above: These flags are valid under Emoji 5.0; but you might not see all of them. Image: Emojipedia. All kinds of states, regions and provinces are now valid Unicode sequences. As such, vendors now have a much larger choice of emoji flags to support, should they wish. "Specific platforms and programs decide which emoji extended flag sequences they will support. There is no requirement that any be supported, and no expectation that more than a small number be commonly supported by vendors." TL;DR: If vendors now want to support US State flags, they can, but they don't have to. The same goes to the full subdivision flag list. Emojipedia released US State flags as a sticker pack for iMessage in 2016; and we have now added these to our Sample Image Collection with their valid Unicode sequences for your reference. 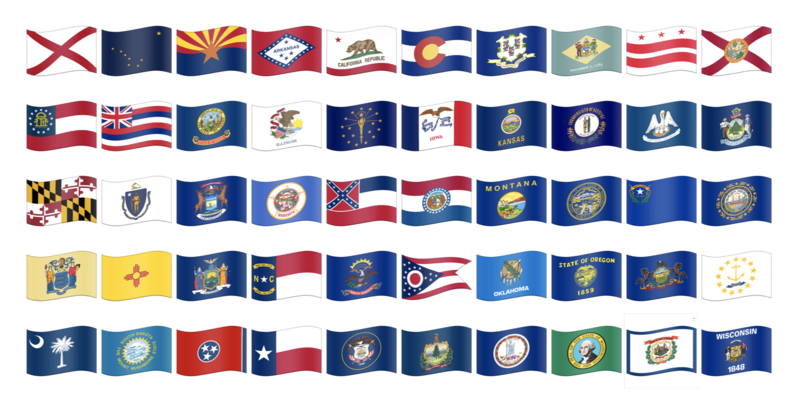 Above: US State Flags are among the many flag sequences that are now valid in Unicode. Will any vendors choose to support them? Image: Emojipedia. The United States has 56 subdivision codes in total. These are the 50 states, plus Washington DC, American Samoa, Guam, Northern Mariana Islands, Puerto Rico, U.S. Outlying Islands, and U.S. Virgin Islands. With a current tally of 3,681 subdivision codes around the world, vendors are unlikely to support all of the possibilities unless they dramatically improve the user interface for choosing a new emoji! Above: Liberian County Flags: How many can you recognize? Image: Emojipedia. Whether users can identify the vast majority of subdivision flags around the world is unlikely. Not to mention that just because a subdivision code exists, that doesn't mean there is a flag associated with it; nor consensus from the people living there that the subdivision is a true reflection of the situation on the ground. As such, vendors may choose to support just a subset of those now available. Of the 3,000+ valid subdivision codes, three have so far been specified as Recommended for General Interchange (RGI). As such, users can expect that all operating systems with support for Emoji 5.0 will have these flags alongside the existing emoji flags. Above: Flags for England, Scotland, and Wales are included in Emoji 5.0. Image: Android O beta. It's possible that vendors with more flexibility in their emoji support like Twitter may add more than the "RGI" list of flags. Regardless of platform or RGI status, if any vendor now wishes to support a flag for Texas or Northern Ireland; they can. 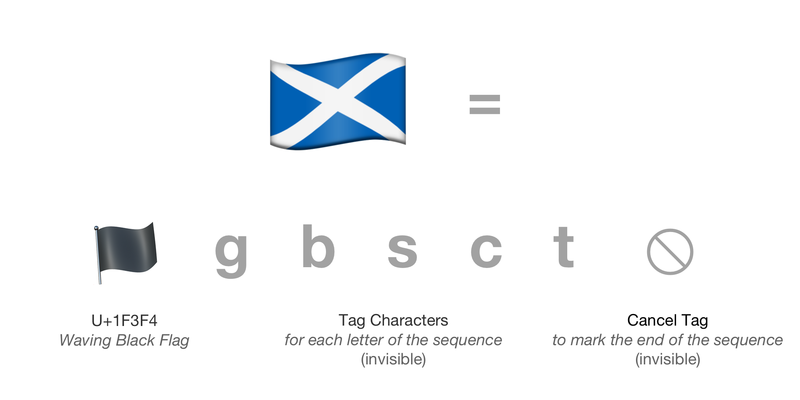 The new "extended flag sequences" are created by joining the emoji for 🏴 Black Flag and a series of invisible letter characters. Systems that don't support subdivision flags currently just show the single black flag, with the invisible characters after it remaining hidden. Supported systems will of course display the actual flag emoji; as Android O beta and Twitter already do today. This makes it clear that the user is not seeing the flag as intended in a way that the single black flag emoji does not. Not every flag in the world has a subdivision code. 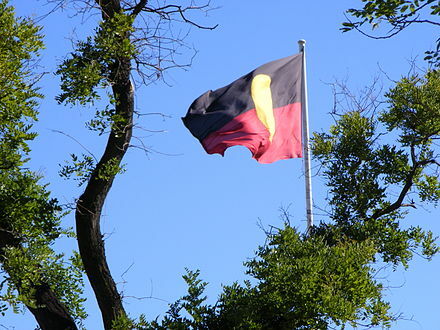 For instance, the Australian Aboriginal and Torres Strait Islander flags do not have the same status as Western Australia, or Queensland which are listed as subdivisions of Australia. This means that even though the Aboriginal Australian flag is more iconic and well known than the flag for Queensland, the latter is technically valid as an emoji flag, while the former is not. As a side note, this New York Times article may lead people to assume that Australian Aboriginal and Torres Strait Islander flags already have their own Unicode emojis. This is not the case. The emojis referred to in this article are implemented using Twitter's own custom implementation which only works within the Twitter platform. These display after specified hashtags, and only for a certain period of time. Twitter emojis (aka hashflags) have no relation to the emojis that show on emoji keyboards, and work within any app. Twitter is free to add and remove as many of these as they wish, at any time. Emoji 5.0 was released on May 18, 2017. Most major operating systems are expected to support this in the second half of 2017. View the final emoji list for 2017 or the list of valid subdivision codes. Sign up to our free newsletter for the latest emoji news, first.